The Utah Legislature is now in session, and this time around there are more female lawmakers than ever before. Twenty-five women, including five women of color, currently serve as state senators or representatives in Utah. These women make up 24% of the 104-member Legislature. The improvement is significant. The Utah Legislature now has the same proportion of women as the United States Congress, which also includes more women this term than ever before. I am grateful for the efforts of coalitions like Real Women Run, who have worked tirelessly to bring about this change. Even so, I look wistfully to our neighbor to the West, Nevada, which currently has a narrow female majority in its state legislature. This cohort of Nevada lawmakers is the first American legislature in history with more women than men. Did you catch that? Almost a century after most American states started allowing women to become lawmakers, only one of the fifty American states has ever had a majority female legislature, and it happened for the first time this year. People sometimes tell me that if my church, the Church of Jesus Christ of Latter-day Saints (LDS), extended the priesthood to women, men would be displaced, lounging around with nothing to do while women took over. That certainly hasn’t happened in secular society. Don’t worry, men! Utah’s Eastern neighbor, Colorado, is also having a record-breaking year for female representation, with 45% female representation. Political pundits are crediting the recent improvements in female representation to female organizing and activism. I don’t doubt they are right, but I also wonder why progress has been uneven across the nation. Why hasn’t my home state of Utah achieved proportional representation like our neighbors? 1. Utah is the only state where the majority of its citizens are members of the LDS Church. Nevada has the 4th highest proportion of LDS members in the nation, at 6%. That’s a lot of LDS people, but not nearly as many as Utah at 62% LDS. Members of the LDS church are accustomed to seeing men – and only men – in priesthood leadership positions. Naturally, some church members may choose to vote for the kinds of leaders they are accustomed to. Inequity in religious societies spills over into the secular societies that surround them. In Utah, members of the LDS Church make up 88% of the legislature, well above proportional representation for a group that is 62% of the state population. Likewise, LDS church members are often overrepresented in Congress in comparison to the LDS share of the American population. While LDS women have held state and federal office, LDS elected officials are disproportionately male. Latter-day Saint men gain leadership experience and social contacts in the male-only LDS priesthood hierarchy. I have often heard fellow Utahns say things like, “He used to be a stake president, so I know he’s honest and hard-working and I’ll vote for him.” The same can never be said for a woman. 2. 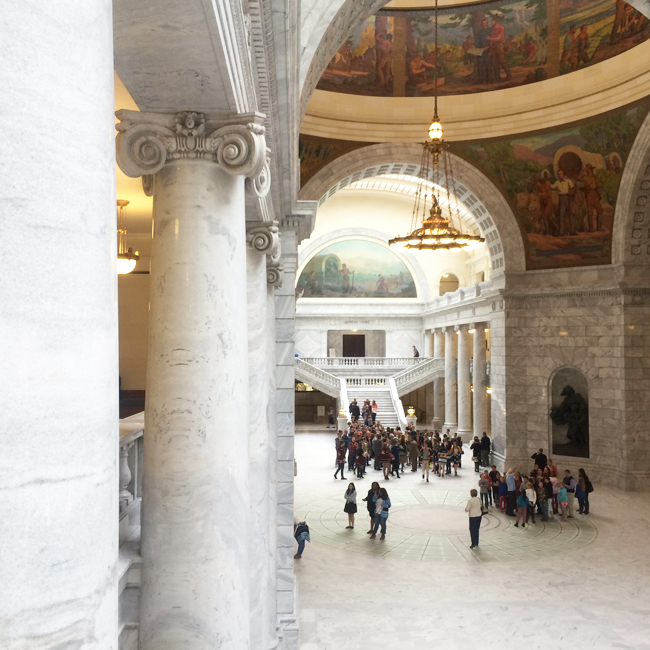 The Utah Legislature has a Republican super-majority. In contrast, both Houses of the Nevada Legislature are controlled by Democrats. In Congress, there are 7 times as many female Democrats as female Republicans. Nationwide, 61% of women in state legislatures are Democrats and 38% are Republicans. During the recent election cycle, Democrats gained support among almost every demographic of women—including white women, who have historically been more likely to vote Republican than women of color. Pundits say that both a Republican platform that is unfriendly to women and Republican support of men with sexual harassment histories is fueling this exodus. There are still many women left in the Republican Party, but fewer of them run for office, and among those who do, fewer win. While advocates for gender parity in legislative leadership have sought to promote women within both major political parties, they have had more success within the Democratic Party because Democrats actively seek to recruit and promote women in a way that Republicans do not. The dominance of both Republicans and LDS church members in Utah politics are not unrelated. In spite of professed political neutrality, church leaders tend to promote mostly Republicans to high-ranking clergy positions and often use Republican jargon in religious talks. (I’ve written about that before here.) American Latter-day Saints take the hint and overwhelmingly vote Republican. I look forward to the day when it is just as likely that a legislative body will be majority female as majority male. In my home state of Utah, that day is still a long way off. Being in the UK I don’t know exactly how the people voted for are chosen to stand. Here it depends on the party, some use positive discrimination to ensure that a women is selected. As I am not a party member I have no part in this. As a voter I have always voted for only one party in the UK in General Elections, and one other in local elections from time to time. I vote for that party no matter who is standing – Black, White, Asian, LGBTQI*, Male Female. I really don’t care, unless there was some overriding thing about the person, their history, something they said, I would vote for them because they are standing for the party I vote for. So the problem isn’t the electorate’s. It is the party putting forward the candidate. As I said, this may not be the same in the US. Here, each part of the state is divided into smaller jurisdictions, usually about the size of a town or suburb, and the residents of that smaller jurisdiction who are members of a political party vote for a candidate who lives on their jurisdiction to represent them on the Legislature. This is called a primary election or a caucus. Then there is a second election, called the general election, where all of the residents vote between the people who won the Primary elections in each political party. There are two major parties, so most general elections have two major candidates. April, I find myself interested in your nine year old daughter’s enlightenment. As I have mentioned before, I have six daughters, ages 31 to 16. I believe they are fairly well rounded individuals. They are different, and in many ways alike, but none has ever been extremely worried about gender issues. Yes, they are aware of gender issues, but they don’t seem to find any of these issues bothering them. No issues with Church leaders, no problems with the temple (for the two that have been endowed) and for the others that Priests get to baptise. So, does your daughter do this because her mother is a Feminist advocate? Do my children not do so because the Church system has annulled them to such sensitivities? Or, is the UK society so different from the US one that gender issue are not as stark? I genuinely do not know. But the very idea of a nine year old noticing such things is a new one to me. I don’t know why this was something my daughter noticed. Any of the factors you mentioned could have had something to do with it, or it could have been a natural question without any particular trigger. (Mr parents were not feminist advocates, but I noticed gender equity without any parental guidance.) Also, we need to consider the audience. A girl (or a woman or anyone else) may be more likely to talk to someone about their gender equity concerns to if they think will be open to the discussion. If they think the person they are talking to will be dismissive, they may choose to keep their concerns to themselves. I think this is a big part of the reason many men who dislike feminism report to me that none of the women they know have feminist concerns. Women don’t talk to them about gender equity, because they know they will not be a receptive audience. I don’t know why either of my daughters took note of gender disparities at such a young age. They started the conversation in both cases. But clearly these differences are easy for children to see. Utah has a higher percentage of female state legislators than Alabama, Arkansas, Indiana, Kentucky, Louisiana, Mississippi, North Dakota, Oklahoma, South Carolina, South Dakota, Tennessee, Texas, West Virginia, and Wyoming. Its percentage of female state legislators is within five points of Delaware, Kansas, Massachusetts, Missouri, Nebraska, North Carolina, Ohio, Pennsylvania, Virginia, and Wisconsin. Since a majority mormon citizenry is unique to Utah, I find it hard to accept that as an explanation for its percentage of female state legislators since so many other states have similar or lower percentages. Most of the states you mention are Republican-dominated. The correlation between Republicanism and low representation of women holds true (and the church undoubtedly does promote being Republican). Also as I look at those states I see many that I identify with the Southern Baptist or other evangelical religions. The correlation is less about the LDS church specifically and more about patriarchal institutions that promote male voices as those of authority and wisdom, in my opinion. I agree with the correlation between Republicanism and lower representation of women in state legislatures but April’s statement was that members of the church are more likely to vote for a man over a woman and that’s not entirely clear from the limited data presented. Is it because voters in these states are more likely to vote for a man over a woman or is it because women in these Republican dominated states are less likely to run for office? I really don’t know because I haven’t researched the data but if your only choices at the ballot are men, or the only choices from your party are men, that’s who you vote for. And if so, is that due to culture or politics since women identify more with the Democratic party than the Republican party?